Join us at Maryhill Museum of Art for a summer tradition – a magical overnight campout and stargazing experience in one of the most majestic settings imaginable. Volunteers from Rose City Astronomers will provide telescopes to give visitors awe-inspiring views of the summer night sky over the Columbia River Gorge. Catch glimpses of the Milky Way, the Andromeda Galaxy, Sagittarius, Jupiter, Venus and Mars! A special group of children’s telescopes gives little ones the same incredible views. 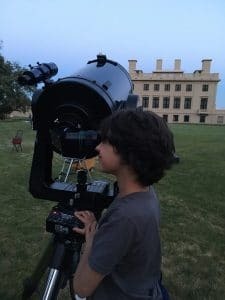 Learn about the stars during a twilight conversation with Troy Carpenter from the Goldendale Observatory and storyteller Will Hornyak sharing a selection of star stories. Arrive early in the afternoon for sun viewing with special filters, hosted by the Friends of Goldendale Observatory (starts at 3 p.m.). Includes campsite in the gardens at Maryhill, and one (1) free admission to the museum for each member in your party. Tent and RV sites accommodate one tent or RV. Campers provide their own tents and camping gear. No cooking or fires permitted. There are no RV (electrical) hook-ups or showers. Deadline to register for tent or RV site is July 15. To register, use the form on this page.